Each year I run two craft retreats. Ever wanted to spend a whole weekend crafting and eating amazing food? My craft retreat is for you. The next one is coming up in April (27th to 29th) and will be a fabulous time away as always. Each retreat we have regulars come back and newbies arrive and everyone is always so welcoming and friendly. It is such a great atmosphere. Here’s alittle snapshot of the retreat and what you can expect from the April retreat. Everyone had a beautiful name tag. Some people used them as accents on projects or kept them with their others from previous years. I always take a few jackets and even a knee rug because I ALWAYS get cold. If you always get hot make sure you ask to be positioned under the air con. All rooms (craft and sleeping) are air conditioned. Kirsten’s project space. She had ideas from pinterest she wanted to created and achieved all her craft retreat goals by going in with a plan. Everyone busy making things. Don’t we all take too much “stuff” to these things. I think the 3 people who created the most scrapbook pages or cards were those who didn’t bring much and had things a little planned out. Kits made or bought. Something to think about for those of you who bring everything. Of course there has to be a kind of tricky card to complete. Stay tuned for the video of this card. The retreat cost, $260, covers all food (morning and afternoon tea, main meals as well as supper) and accommodation, welcome pack, gifts, prizes and between 3 and 5 make and takes. Registration is essential and deposits or a payment plan are required to be in place by the end of January. Some ladies pay their retreat off at $25 per fortnight. Please contact me for more information on registration and payment. We would love to see you there and enjoy your company for the weekend. It is with great pleasure I welcome you to my blog from Pauline’s blog. I’m sure you’ve been as inspired as I have been so far. I have fallen in love with so much of this catalogue and the sale-a-bration items. 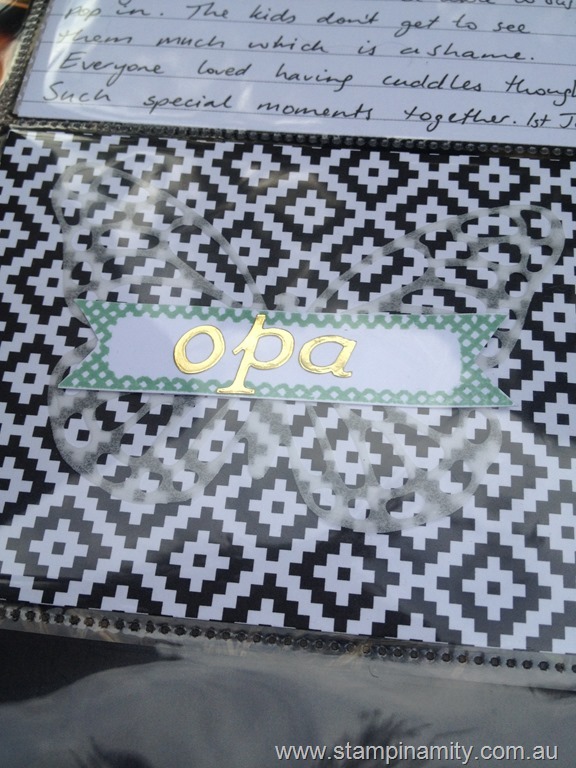 You can get free scrapbooking papers with a qualifying order!!! How good is that? Of course I had to create some scrapbooking pages with the supplies I ordered. 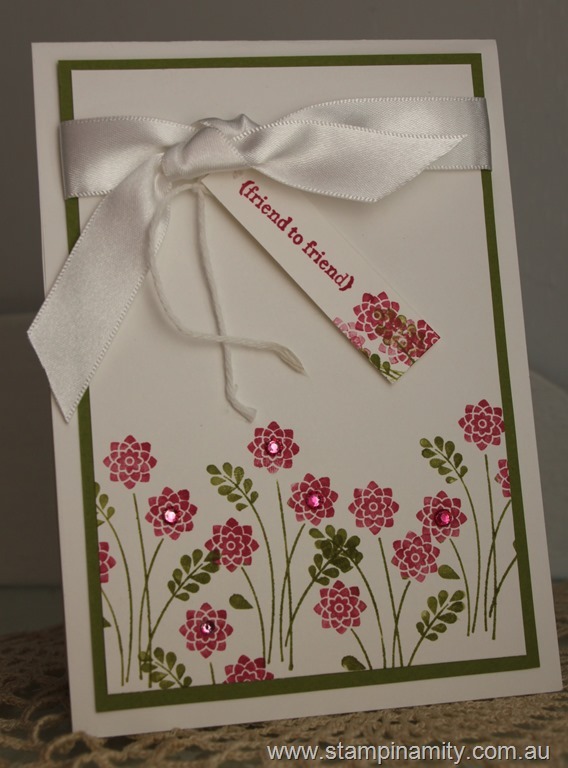 My first layout uses the sale-a-bration freebie Wildflower Fields Designer Series Paper. I used a sketch I found in my stash as inspiration to complete this layout. I was really unsure of the journaling because it is so large but I love strip journaling and I love the typewriter. I can’t seem to just write a little bit. I decided the best idea was to just do it and stop over analysing everything. No one will care in 5 years time that it looks a bit funny and it’s not neat, they will just appreciate the fact that I wrote the story down. The beautiful detail in the middle using the Rose Garden Thinlits Dies was actually created by accident. I was creating a card for my technique class and these were off-cuts from a card I made. They just happened to fall on the layout and I thought they looked pretty amazing so I stuck them down. Wasn’t where I thought the layout was going but it is a good use of left-overs don’t you think? The second layout, 1st Birthday, I created for my weekly kids’ class. As you can imagine none of their pages turned out like mine but they all followed a similar theme and the design principles I used. 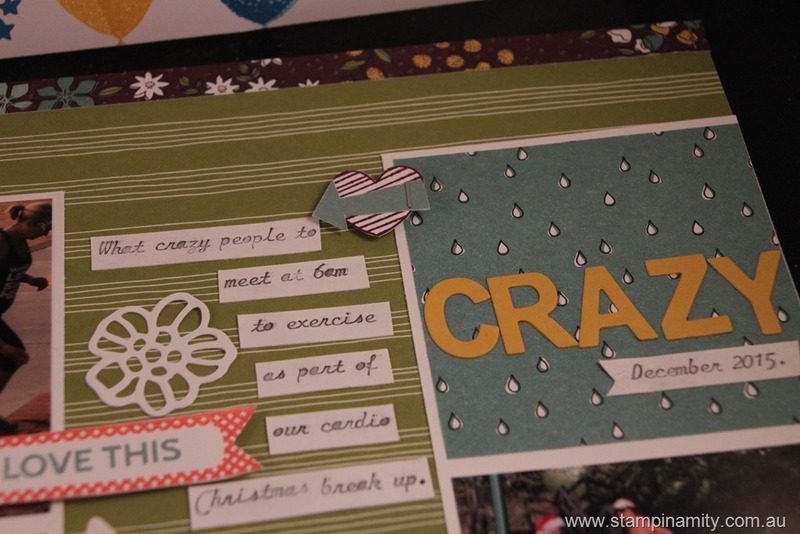 I love that I can create my own personalised background papers using stamps. The kids loved it too. They thought it was fabulous they could stamp their birth month on their page and really make the page about them. The journaling for this page is going in the blank yellow spot. It is a really mushy piece about the last of my 5 babies turning one and how sad that is as there will be no more babies any more but how exciting it is for us to be entering a new phase of our lives. 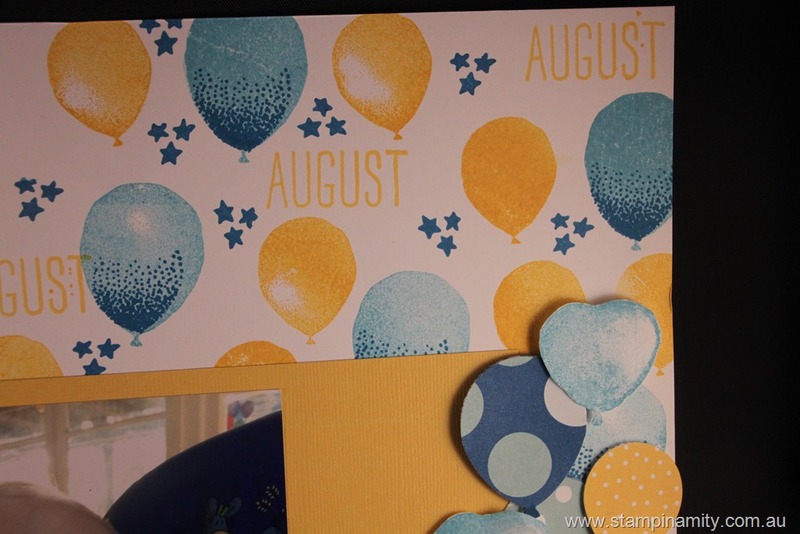 Don’t you just love these balloons created with the Balloon Builders stampset? 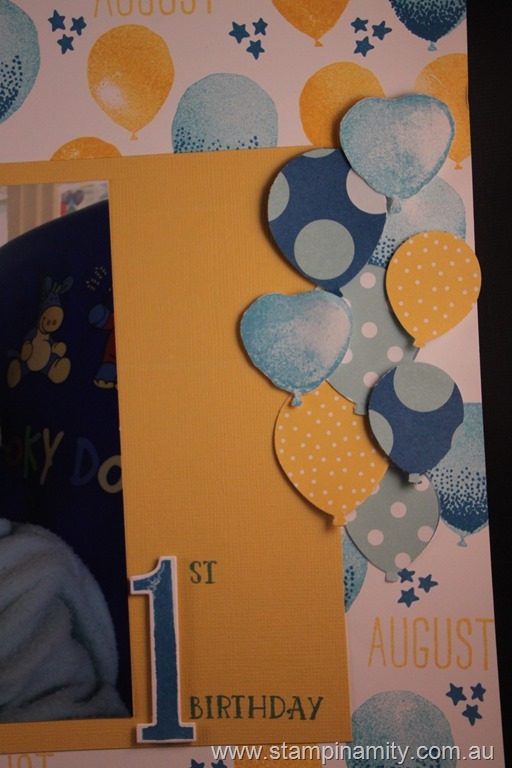 I hand cut the heart shaped balloons but the balloons out of the patterned paper are punched using the Balloon Bouquet Punch which also has a co-ordinating stampset. I can’t tell you how much I love these 3 items. I love balloons for all kinds of things. Balloons always seem so happy to me. Please head on over to Courtenay Heuston’s blog now. Below is a list of everyone in the hop in case you get lost. Thanks for dropping in from Donna’s amazing blog. Of course when it comes to a new catalogue I like nothing more than seeing all the new scrapbooking items. What is your favourite section of a new catalogue? 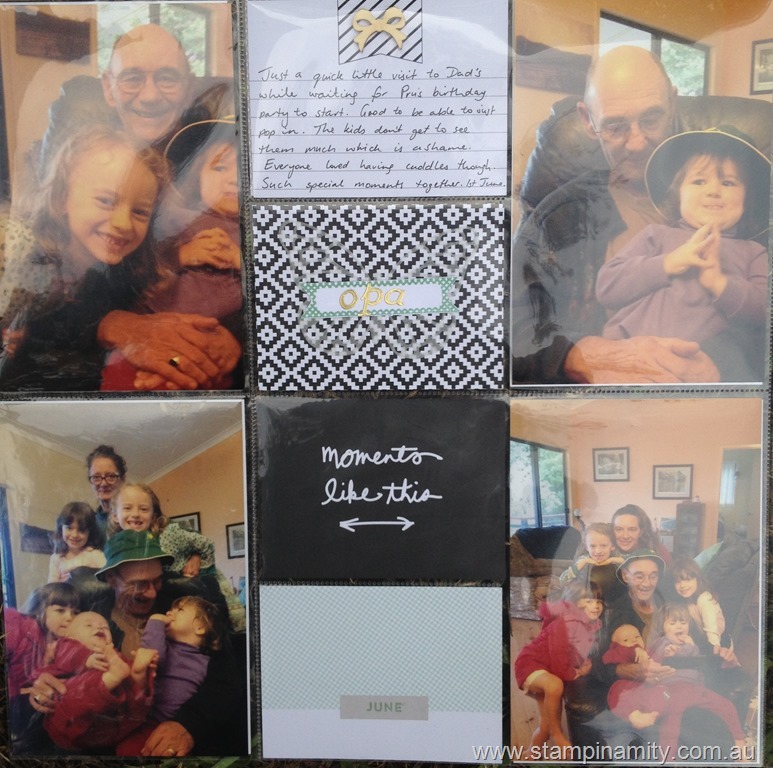 Today I’m focussing on the Moments Like These Project Life kit, Moment Like These accessory kit and the Moments Like these stamp set. Trust me you’ll love these. I appologise for the photos. I tried on numerous occasions to get photos of these layouts without the glare but I just couldn’t manage it. 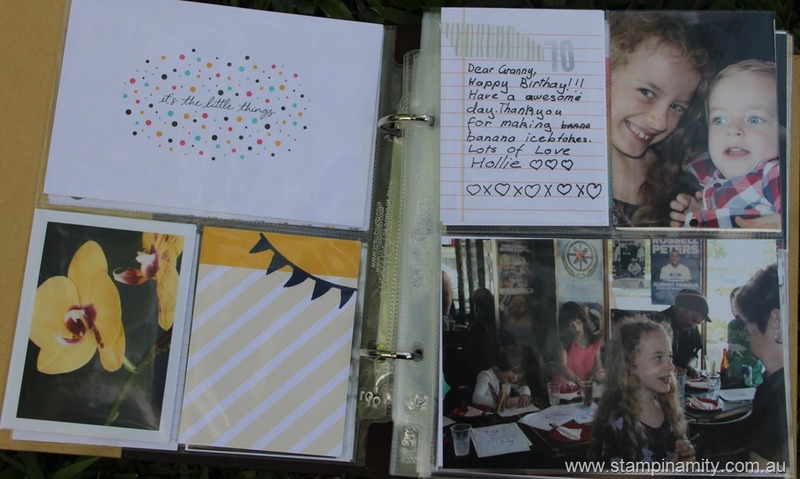 Hopefully you can read some of the journaling. That’s the most important thing to me. The journaling. A bit of subtle tone on tone. So here’s a tip for you. Don’t get caught up in whether or not you have enough photos to fill the entire spread. 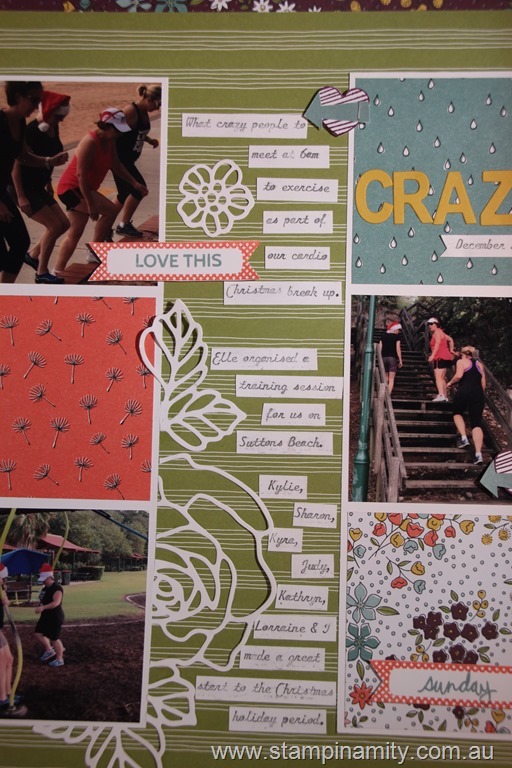 I work out of order when I scrapbook. If you don’t have enough photos to make an entire page just leave them blank until you get to the next month and you can slip those photos in. Leave them blank and if you don’t have photos to go in there just add some filler cards. Your album can be a work in progress. Don’t forget it’s about getting the memories recorded. It doesn’t have to be perfect or complete. There is very little in the way of embellishments on these pages. I just added a few stamps and some of the stickers from the accessories kit. Simple and easy and allows you to get it done. These following photos were taken on my iPhone. They are very bad quality but I just had to include them in my album as they were taken when I took the kids to visit my Dad and step-Mum. We don’t often see them so it was important for me to include these photos in our family album. Don’t you just love that little wood veneer bow? It is from the accessories kit and is soooo cute. Just some subtle detail by adding in a die cut from the butterfly dies. I have a video of the whole kit if you’re interested just check out my YouTube channel. It really is a versatile kit. So now onto the next blog post which will take you back to the start. 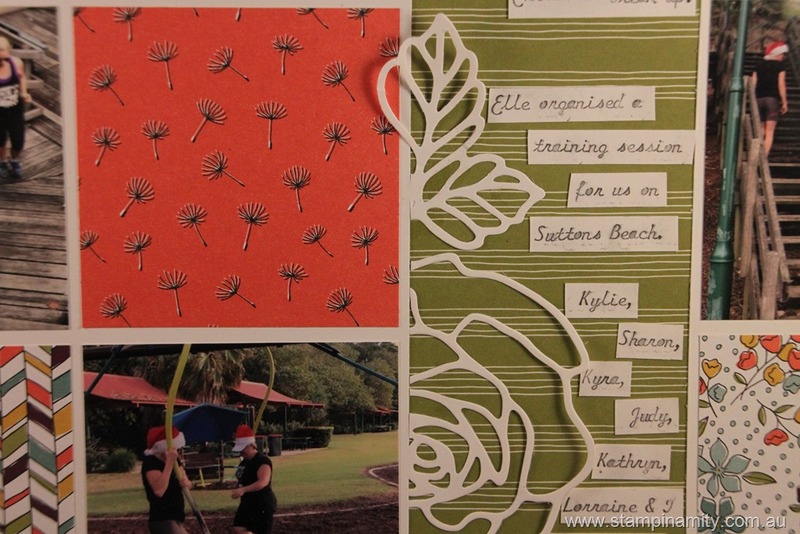 A group of amazing Stampin’ Up! 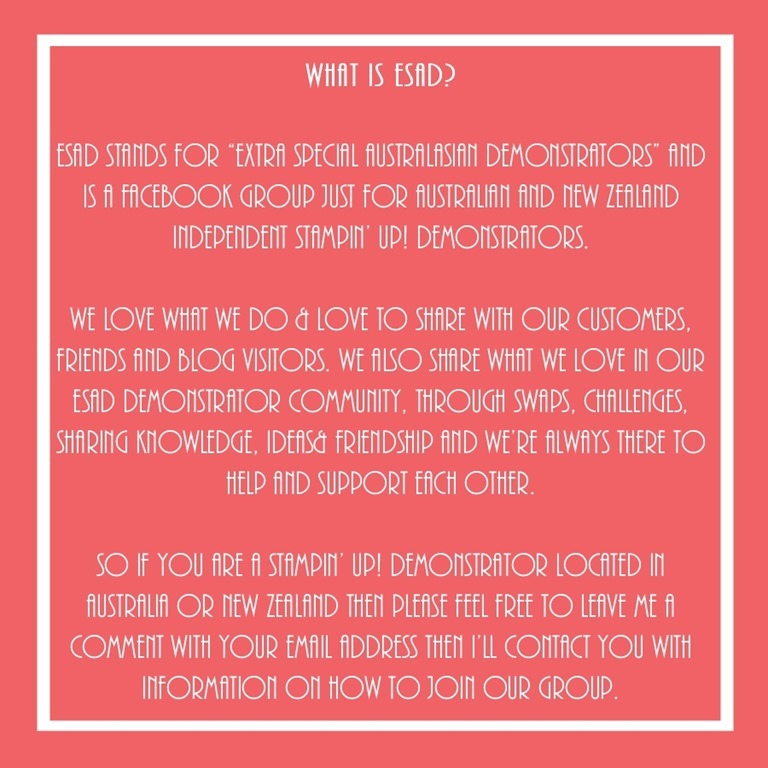 demonstrators and members of ESAD decided to showcase a heap of retiring product for you. Want to see what we love? 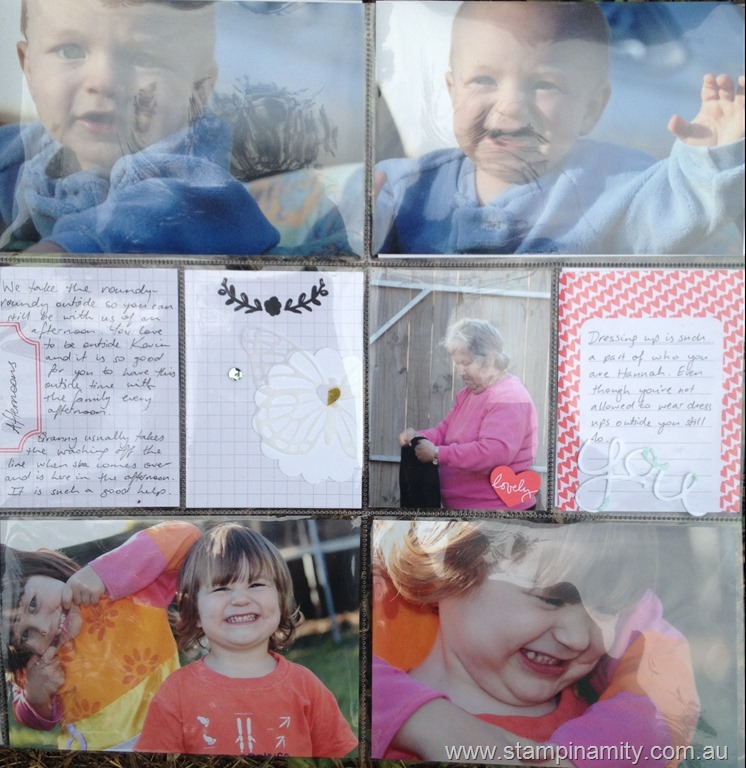 I created this album for my mother-in-law for her 70th birthday. 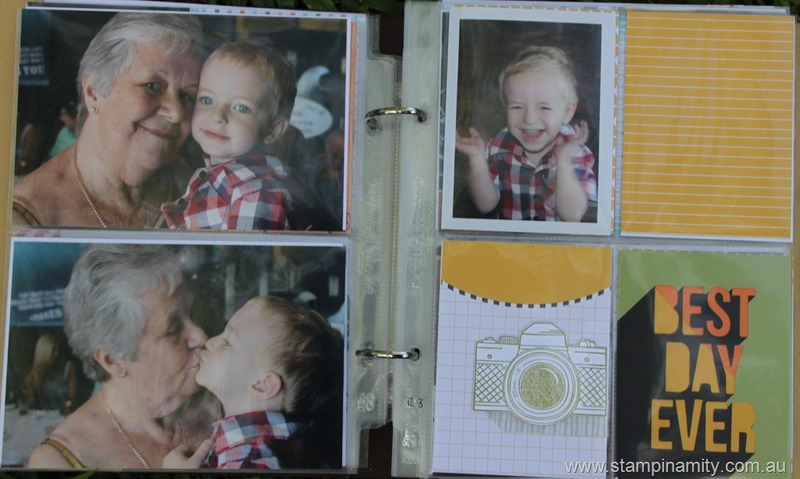 It was so easy to do with the Project Life products we sell. Don’t worry. Project Life isn’t leaving our range we are just retiring all but one kit and bringing in a heap of new kits. That’s awesome right? Currently the Project Life kits are half price. That’s even better. A video showing the whole album will be uploaded to YouTube and posted here tomorrow so make sure you pop back and check it out. So easy. 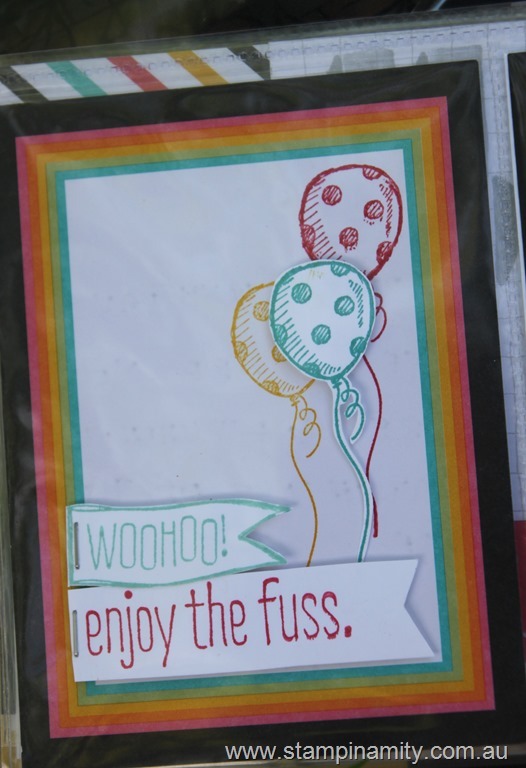 Just add a few stamped images in co-ordinating colours and you’re done. 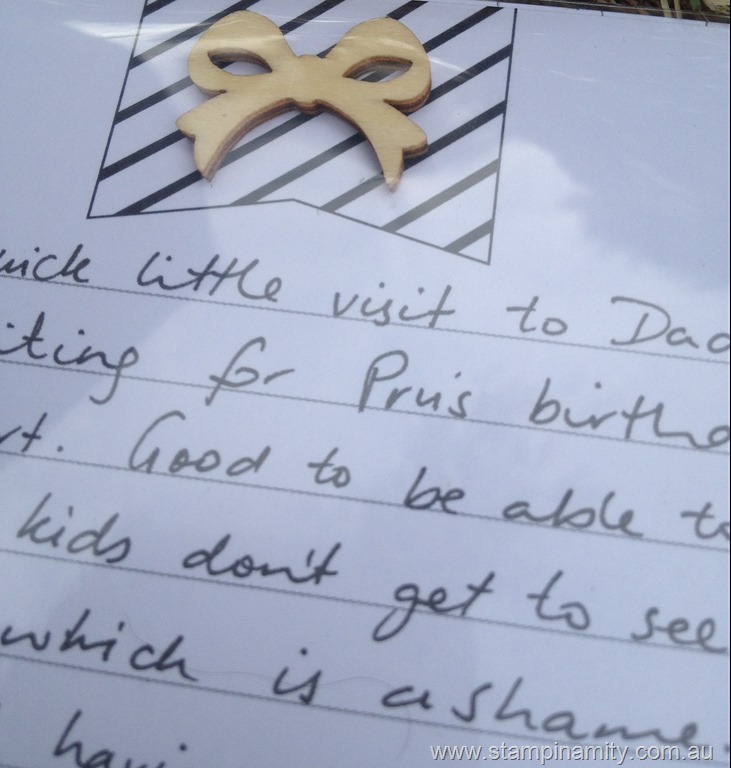 I had guests, including my children, write on a card to include in the album. It was so easy to put together because they, the guests, had done most of the hard work for me. All I had to do was trim the photos and pop them in. Embellishments were optional. 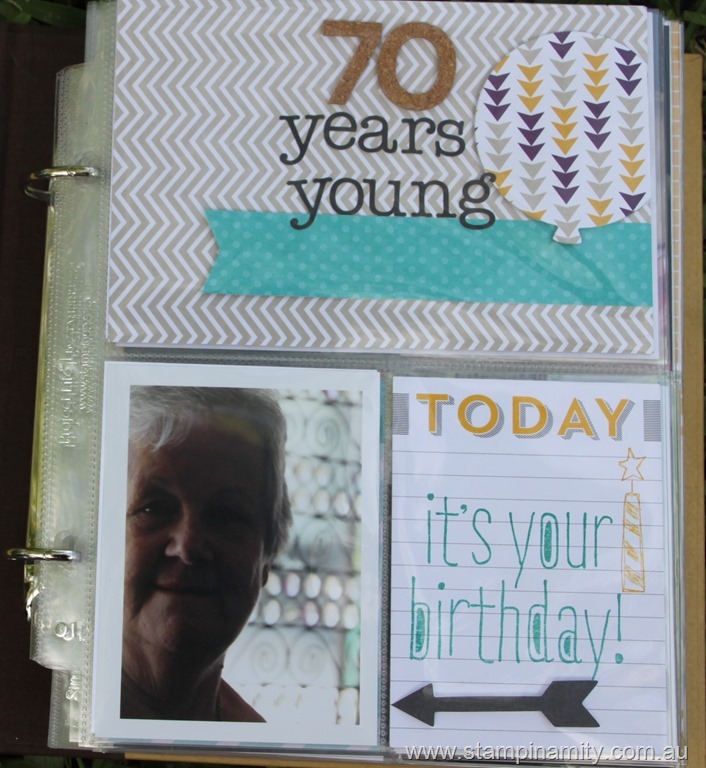 I left a few blank journaling cards so my mother-in-law could include some of her own journaling of the day. One of my favourite stamps to be retiring is this camera stamp. I use it all the time in my scrapbooking and in my project life. It’s called Snapshot and I just love it. 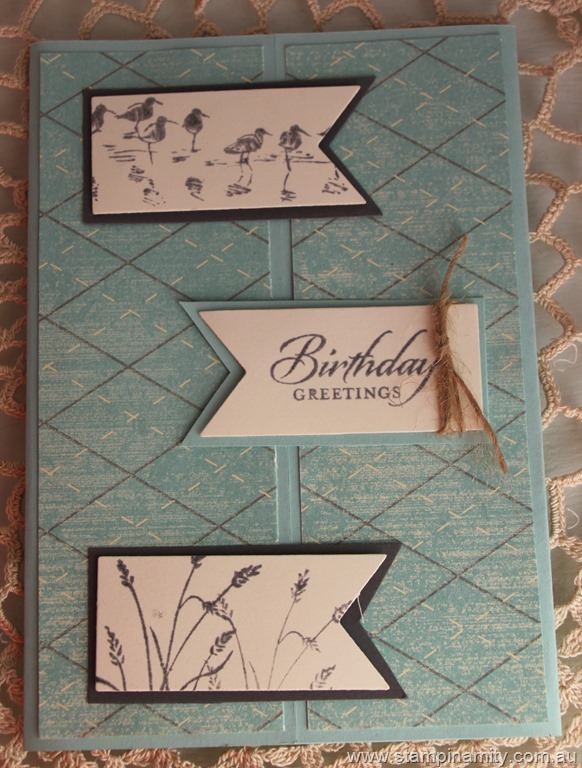 This stampset Sketched Birthday is another favourite of mine for both scrapbooking and card making. It just looks so good when you fussy cut the little balloons out. 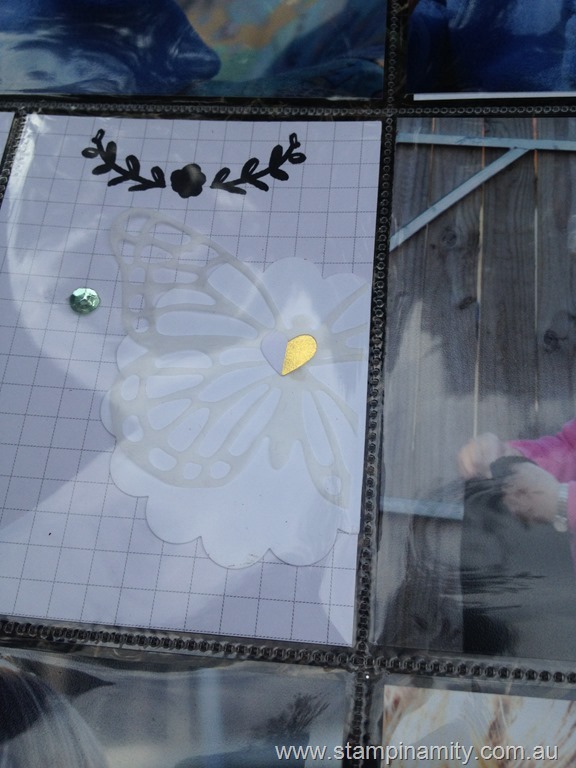 This butterfly is from Butterflies thinlits and is just the baking paper I used to make it easier to pop out the cardstock from the die. this is a beautiful die and I’m so glad it will be in the new catalogue. Tomorrow I will be uploading my Youtube video of this album so make sure you check back in. Thanks for stopping by. Next you’ll be visiting Narelle. If you get lost please see the bottom of my post for a full list of blog hop participants. Alphabet Press TIEF, Label Love, Playground PL card kit, Calypso Coral & Crushed Curry embossing powders, Daffodil Delight seam binding ribbon. 9. 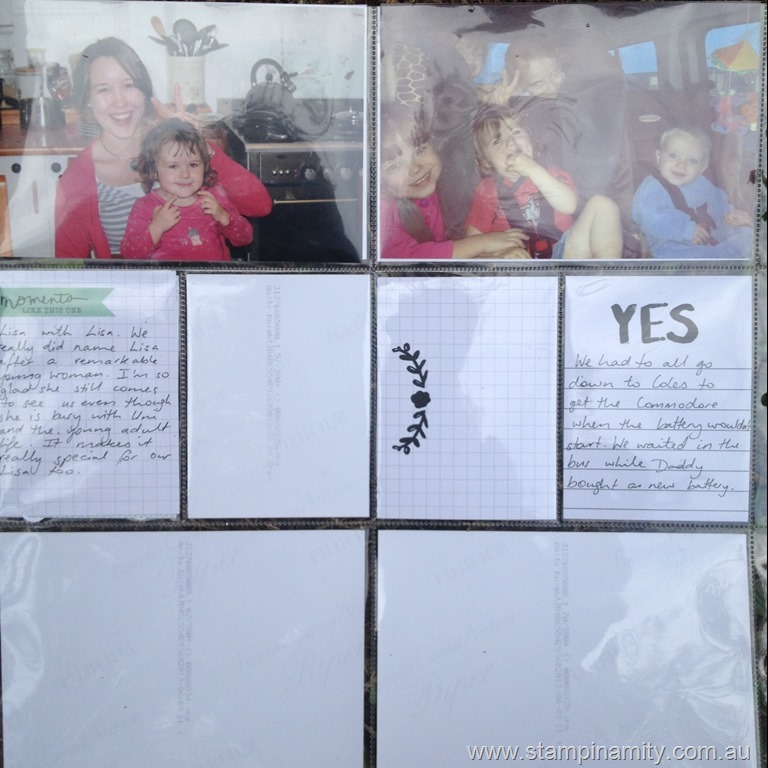 Amity Knight – https://stampinamity.com.au/ You are here. 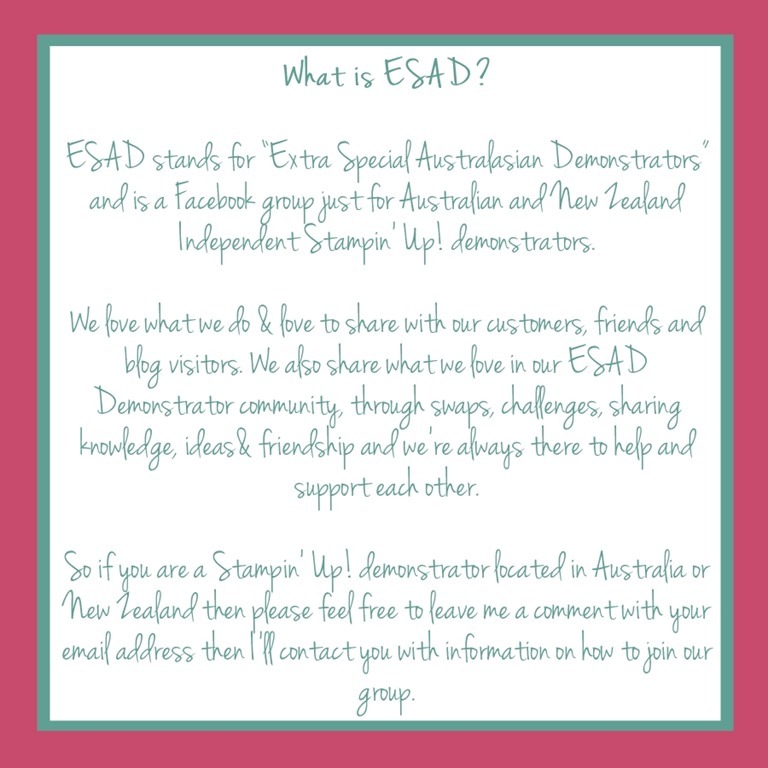 ESAD stands for "Extra Special Australasian Demonstrators" and is a facebook group just for Australian and New Zealand Independent Stampin’ Up! demonstrators. These cards were created last year, for a class I ran last year. Laziness has prevented me from posting these pictures but here they finally are. This wasn’t quite a stamp-a-stack class. Participants made 10 cards, two of each card (although the 5th card is missing because I’ve already sent it). This is such a simple card. I love, love, love stampsets with matching punches or dies. 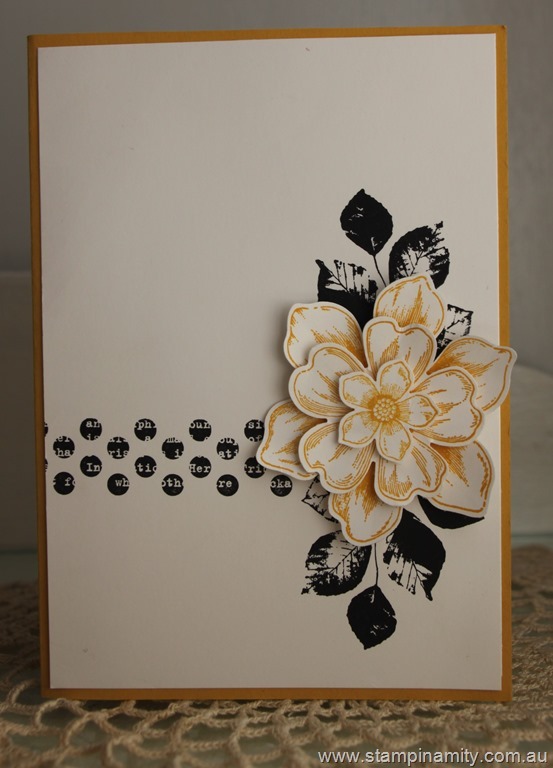 Petitie petal stamp and punch and the wonderous wreath stampset and dies made this card so easy to create. Just an interesting way to use the Wetlands stampset. 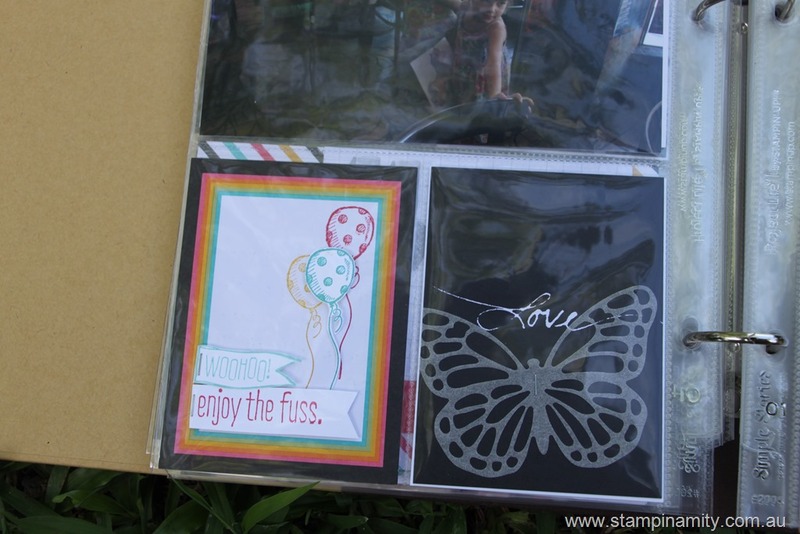 Embellished events is the perfect stamp set for any occasion. It has a sentiment and image for every occasion. 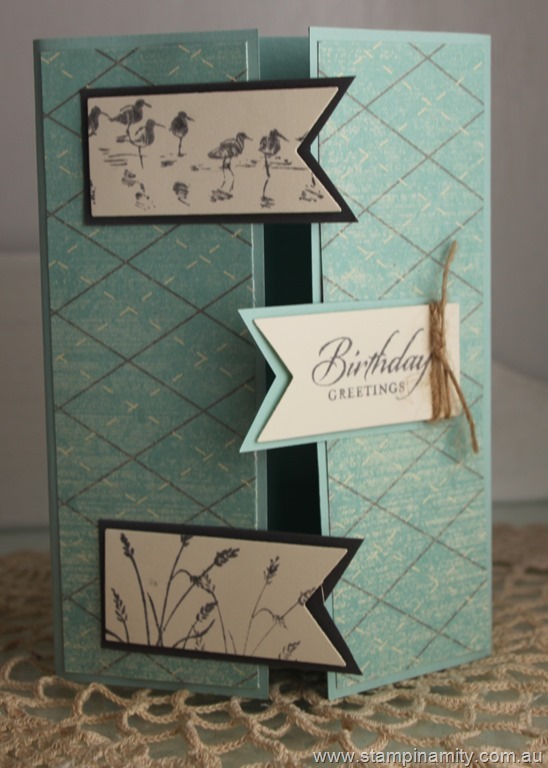 Here is the video of how to make this simple but elegant card. Please subscribe to my YouTube channel.